New Orleans Saints quarterback Drew Brees made history, becoming the NFL's all-time passing leader. The 39-year-old QB surpassed Peyton Manning's record of 71,940 yards with a 62-yard touchdown pass to Tre'Quan Smith late in the second quarter against the Washington Redskins. 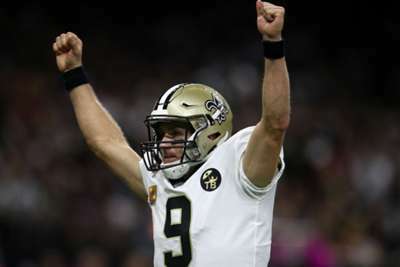 Brees – a Super Bowl champion and MVP – entered Monday's game 201 yards shy of the milestone. The Saints briefly paused the game so Brees could savour the special moment with his team-mates and family in front of the home crowd. Manning's record stood since 2015 when the future Hall of Famer passed Brett Favre's mark of 71,838 yards, which had been upheld since 2007. Brees previously set an NFL record for most career completions in week three, surpassing Favre's previous mark of 6,300 as he connected with wide receiver Michael Thomas on a 17-yard pass against the Atlanta Falcons. Brees entered the game 122-of-161 passes for 1,295 yards and eight touchdowns this season.